November 5 - 6:30 p.m.
"Report on Economic Development in Central Kentucky"
"Report on Madison County Schools"
"Discovering the Impact of Violence on our Youth"
Joanne K. Glasser spoke to the Richmond Kiwanis Club less than one week after her taking on the assignment as the 10th president o Eastern Kentucky University. She is the first female president of the university. In her address she called for a close working relationship between the university and individuals and businesses in the community. She said she got to know the community better when she and her daughter "camped out at the Hampton Inn for nine and one-half weeks." It was just last week that she moved into Blanton House, the home of the EKU President. She said that during that time she ate in most of the restaurants in Richmond, shopped at the mall, and used the laundromats. She said she now has a much better appreciation for the community as a whole. She said, " I appreciated the warm welcome we received from people in the local supermarkets to the governor's office." She added, " I feel Governor Patton's vision will distinguish Kentucky as a national leader in higher education." She said she will work to have Eastern Kentucky University recognized internationally. She said it is one of the most beautiful campuses in the country, has a wonderful record of service to the state and community, and has an outstanding faculty. She said the 84,000 alumni are another major asset of the institution. She said, "Eastern is one of the finest comprehensive universities in the country and I wish to take it to the next level of excellence." She invited all Kiwanians to attend a convocation she has called for 8 a.m. on November 10 in Brock Auditorium. She characterized this as a conversation about the future of the university. She said she wants to hear what others dreams are for the university. She further identified this process as an opportunity for the Eastern family to come together. She said her goal for Eastern was to be not only good neighbors with the rest of the Richmond community but to be good friends. The second regarded students use of liquor - she indicated that students who can legally drink must learn responsible consumption of alcohol. The final question was regarded community use of the newly proposed Business and Technology Building. She said that the phase two part of the building calls for state funding of the public component of the building which would provide a site for events, conferences, a fine arts center; all of which would positively impact tourism in the Richmond community. She added, however, that the development of phase two was contingent on the approval of the legislature and that hinged on the availablility of funds. She said she hoped the funds would be available because it would be a wonderful addition to the community. Glasser, 50, comes to EKU from Towson University in Maryland, where she has served as executive vice president of institutional advancement. She was named vice president for institutional advancement in 1995 and was promoted to executive vice president in 1999. From 1993 to 1999, she also served as executive assistant to the president and was the University's fair practices/Affirmative Action officer 1993-95. "I am deeply honored and extremely humbled by the expression of confidence the Eastern Kentucky University Board of Regents, its faculty, its students, staff, alumni and Richmond community have placed in me," Glasser said. "Eastern Kentucky University is a wonderful place to learn, to live, and to work. 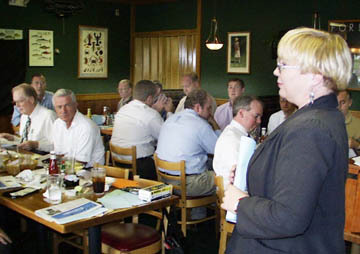 As a dynamic center of learning it is a critical resource to the citizens of Kentucky," she added. "I look forward to continuing to expand Eastern Kentucky University's role in offering opportunity, support and cooperation with the community and the region. I also look forward to working with all the people in forging a partnership that will continue to move this institution to even greater regional and national eminence." While at Towson, Glasser directed a $17.5 million capital campaign, the first major campaign in the institution's history, and developed a University wide marketing initiative. Her campaign to develop a new institutional corporate identity received national recognition. Towson University is a comprehensive institution serving about 16,000 students. The Daily Record, a statewide business and legal news publication in Maryland, named Glasser one of Maryland's Top 100 Women in 1997 and again this year. A native of Baltimore, Md., Glasser earned a bachelor's degree in political science from George Washington University in 1973, a juris doctorate degree from the University of Maryland School of Law in 1976, and a certificate from the Institute of Education Management in the Harvard Graduate School of Education. Prior to joining Towson, she served as Baltimore County labor commissioner 1980-86 and as assistant county attorney 1978-80. She has two children, Jared, 25, and Jacqueline, 15. As part of its Schools and Community Initiative, Forward in the Fifth has been gathering information from various groups about what parents, students and schools need to provide a positive education for young people in the community. These discussions begin with general questions about education then participants have the opportunity to talk about specific issues related to their school system and community. What follows is a summary of some of the information gathered thus far. You might first want to consider each question yourself and write your answers on the form below, then read the answers people gave. 1. What are the three most important things parents need to be better supporters of their children's education? Most people believe parents need information, knowledge and improved communication with schools to be more supportive of their children's education. 2. What are the three most effective support services for young people in your community? The three effective support services, according to participants, are churches, family resource and youth service centers. 3. What is one thing that students need, but the school cannot provide? Participants agree schools cannot provide a nurturing and supportive family, which children definitely need. 4. If you visited a school that had effective community involvement, what would be the first thing you noticed? Most people say they would notice large numbers of volunteers, both parents and community members. Many also noted they would feel a welcoming atmosphere. 5. What is one thing that schools or teachers could do that might encourage more parents to take an active role in school functions? 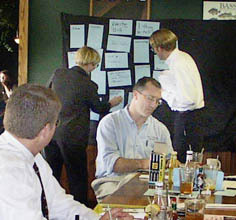 Participants said schools could encourage community involvement by communicating more effectively in a manner that is regular, personal, positive and specific. Mrs. Eager summarized the need an use of the survey at its conclusion. She said the results would be used to aid in applying for a $700,000 grant to serve the educational needs of the former Fifth Congressional District. Sue Hays, the director of the Madison County Library, gave a report on the progress of the library building and invited the Kiwanians to tour the newly refurbished building. 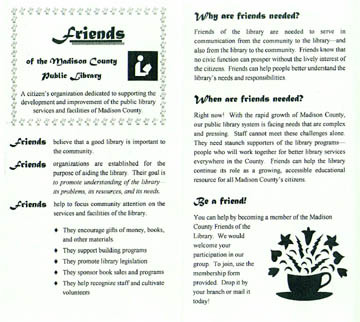 She then challenged Kiwanians to become involved in a variety of library activities. She suggested that Kiwanians take the lead in taking turns reading to children at the library, to assist in the annual book sale, to become public relations spokespersons for the library, and to financially support the library. 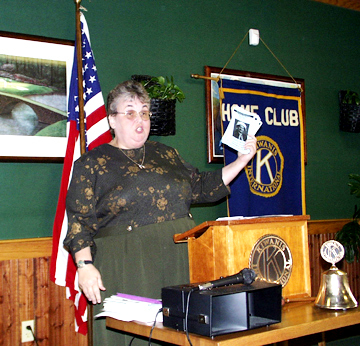 Here she is telling about a chataqua presentation that will soon be given at the library. 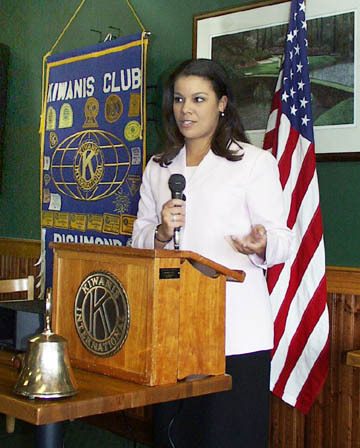 Kristy Runyon, a reporter for WTVQ-TV (Channel 36), told members of the Kiwanis Club about the role of local reporters since the September 11 attack on the World Trade Center. Runyon, a graduate of the Madison County Schools and Western Kentucky University, said she got her original motivation to become a television reporter when in the fifth grade at Mayfield School as one of the originators of Kids First News in Mrs. Joan Kleine's class. She indicated that after she interviewed the mayor she knew she wanted to ultimately become a reporter. Kristy indicated the uncertainty of assignments since September 11. She indicated that she was currently working on a story about an anthrax meeting at EKU and on the use of contributions by the Red Cross. A young lady swirls a red ribbon in front of a background depicting a calm blue Earth, where harmony, equality, and justice prevail. In commemoration of Kiwanis' first worldwide gathering in the Asia-Pacific region, the Republic of China's Postal Service Directorate issued two postage stamps-one mirroring the design of the logo of this past June's convention. The second image is of a woman and child in a heart-shaped embrace. "The design of this stamp follows the mission of Kiwanis International: caring, concern, and helping the needy," says the Postal Service Directorate's description. 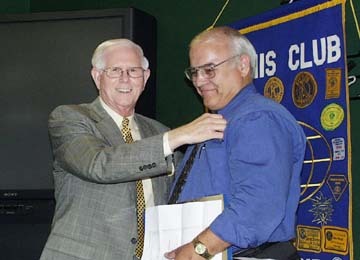 "The simple streamline heart, indicating kindness and compassion, emphasizes the service spirit of Kiwanis International from the day it was built to today."